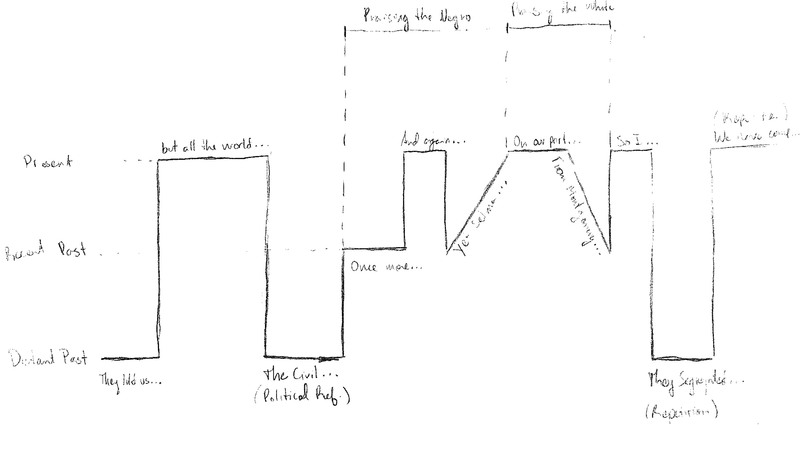 Last week I ventured into largely-unknown territory for me – speech analysis and a consideration of the oral mode. Unknown, I say, because even though teaching involves vast amounts of time standing before an audience and, well, speaking, I have never formally studied speech at length: no speech communication class, no toastmasters, no “how to win friends and influence people” chapter on speaking, nothing. I was drawn to the topic, however, in that this past week was a significant one relating to Georgia Tech’s 2011 Freshman Reading Project. In recognition of the 50th anniversary of the matriculation of African Americans from Georgia Tech, a collection of Martin Luther King, Jr.’s speeches and writings, I Have a Dream, had been given to all freshmen, with events last week including a lecture by Ambassador Andrew Young. When I first learned of these events at the start of the semester, I thought that an examination of Martin Luther King, Jr.’s speeches (both written transcripts, and recorded speech acts), alongside Ambassador Young’s reflections on the Civil Rights Movement, would be a fruitful way for my students to think about memory as well as representation (the topic of my 1101 classes). Given that I’m a visual studies scholar (visual rhetoric, history of photography, etc.) I did feel some trepidation in taking on this aspect of multimodal communication – all the more so because the time period of the speeches (early 1960s) was a few decades away, give or take, from my normal territory of nineteenth-century British and American literature and culture. I’d like to think that my daring to venture into new realms provides an eclectic range of material for my students – and hope that it demonstrates that, although not my area of expertise, one can apply the “tools” of rhetoric and multimodality to critically read a range of texts, regardless of the mode, medium, time period, and so on. At the very least, my openness in admitting that this is new territory for me seems to serve as an “ice breaker,” with students seeming to be more willing to jump in with comments, observations, and analysis. We approached communication via the oral mode through some different exercises that I hadn’t done before with other classes I’ve taught over the years; as the week unfolded, I was relieved, and pleased, to see the students respond positively. 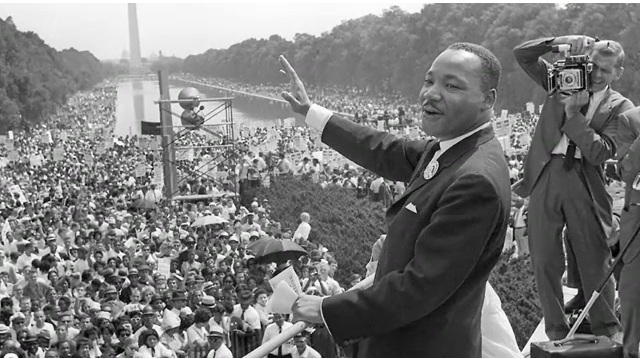 I’d assigned a selection of speeches from the collection, I Have a Dream, and asked students to consider the difference between texts that were composed by Martin Luther King, Jr. as written communication (such as his famous essay, “Letter from a Birmingham Jail”) and those that were composed with the intention of being spoken (such as his heartbreaking, “Eulogy for the Martyred Children” [transcripts of which can be found at Stanford University’s Martin Luther King, Jr. Research and Education Institute]). In class, we discussed their observations, then watched a selection of his speeches, to listen and watch his masterful use of rhetorical devices and nonverbal modes of communication, respectively. 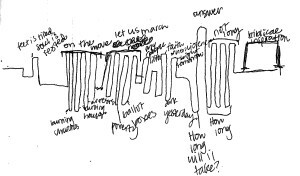 An effective exercise that helped refine the students’ responses about the meaning-making elements of the oral mode of communication was a visual one: I asked students to visualize the patterns of his speech (after watching an interesting speech transcription by Nancy Duarte of “I Have a Dream”). They came up with a surprisingly varied and original range of visual representations that captured the rise and fall, the call and response, the ebb and flow of his rhythmic speech. The students really responded, however, to an experiment that came to me later in the week while I was preparing for our final class on the topic. 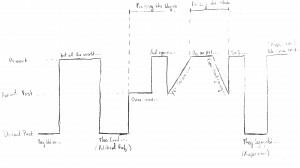 We’d been approaching this week – or, more accurately, I had been approaching this week since before the semester even began – with the notion that we would focus our attention on The Oral Mode. Full stop. And yet we all know as scholars of media, multimodality, and communication, that there is no such singular communication. To that end, I capped our week by asking students to consider whether speech is at heart an oral mode or as much verbal as it is nonverbal and visual. Is it Martin Luther King, Jr.’s powerful words, tone, rhythm, and cadence, or is it just as much his regal carriage, his calm, measured and purposeful facial expressions, his subtle yet powerful gestures? 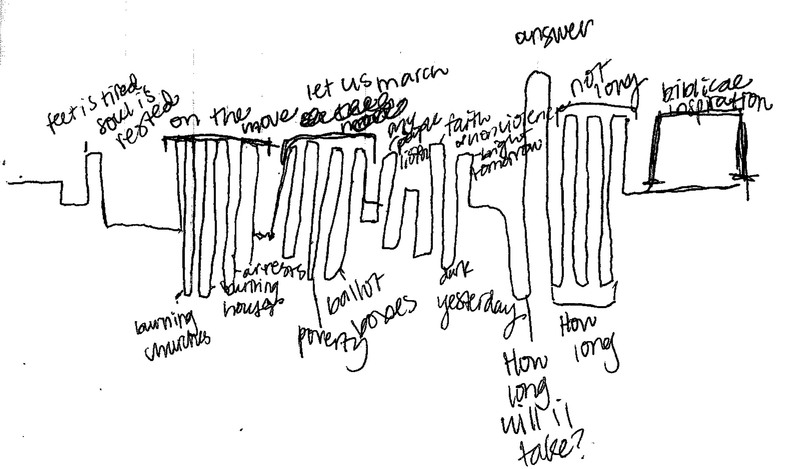 We first listened to “I Have a Dream,” then listened and watched the same speech, with time between to write down and discuss our thoughts. 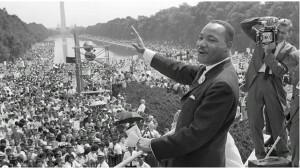 They discussed the effective qualities of Martin Luther King, Jr. as an orator, observed the elements of the speech act that were unique to the visual mode versus the oral mode, and captured quite well the ways in which King, Jr., by his rising voice, his arms gesturing upward, and his words themselves (“now is the time to lift our nation from the quicksands of racial injustice…”), all embodied the rising force for equality that was gaining inevitable momentum (“I Have a Dream” 103). I’m eager to try these exercises out with students again, and think they’ll adapt well to a variety of courses. Next time, I’ll include a third go-around of his “I Have a Dream” speech that involves us watching the speech without sound (as suggested by some students). And, I’ll be pleased to share a link a student emailed me after class Friday, to show my students the interesting ways that critically thinking about a new topic (by the professor, as well as the students) often opens up new avenues of exploration. It’s a musical transcription by Tom Davis that was inspired by “the inflection and delivery” of Martin Luther King, Jr.’s speeches, which Davis describes as “a ‘fresh look’ at rhythmic, melodic and expressive jazz vocabulary.” How exciting to see, and hear, that while venturing into unknown territory, we often have the privilege of meeting those who approach our subject matter from a refreshingly different way – whether scholars in another field, musicians, artists, or students. Tagged English 1101, MLK, oral communication.